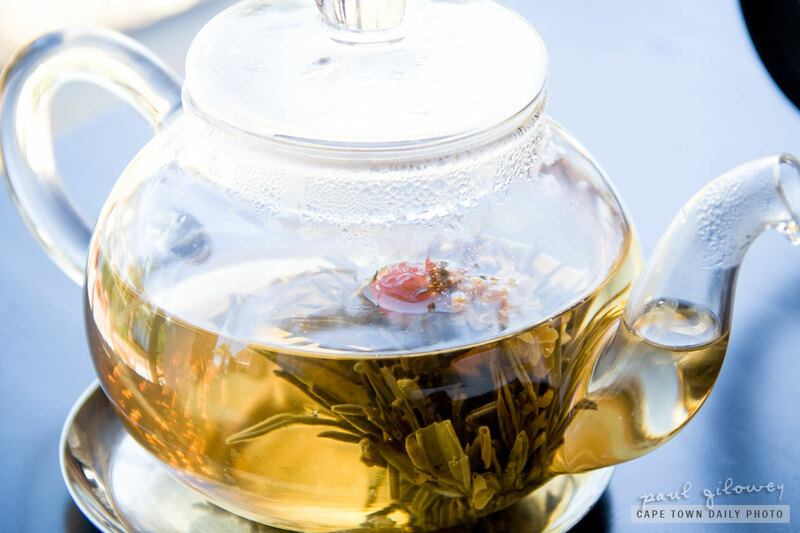 I've only recently become aware of flowering tea - first when Nicola (from Wots for Lunch?) commented on having it at Myatt Café at the V&A Waterfront, and then when Kerry-Anne mentioned that Vista Bar at the One & Only hotel serves a few different flowering teas. At first I though that the tea was some kind of dried flower - presumably from a tea plant. However on closer inspection I noticed that it appeared to be a bundle if tea leaves wound tightly together by cotton thread. From the photo you're able to see that my tea actually had little red flowers hidden inside, that appeared as the dried bundle expanded and "bloomed" in the hot water. Posted in Activities and tagged restaurant, tea on Monday, 10 January, 2011 by Paul.